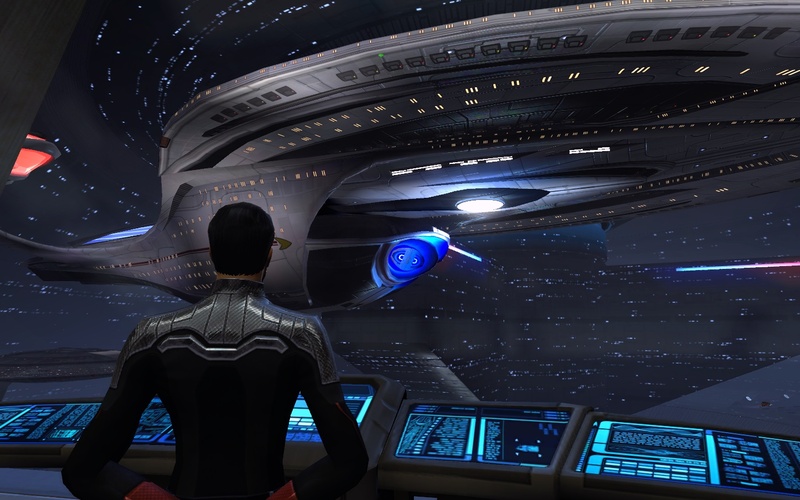 A Star Trek Online Fan-fiction. The doors swished open and Vice Admiral Jase Galleger entered the construction Command room of the Utopia Planetia fleet yard, his gaze immediately drawn to the large bay window that made up the entire wall ahead of him. His mouth opened to gape at the vessel under construction in the main hangar. "Yes..." he said softly, "Lovely..."
The ship was beautiful. Utopia Planetia had really outdone themselves on the new Odyssey class. He walked slowly to stand closer to the window, taking in the immensity of the vessel. Lieutenant Laurel was working at a console nearby and looked up to Jase as he entered. She smirked in slight satisfaction at his reaction. “Beautiful, isn’t she?” Her voice startled him slightly, so lost in his awe as he was. He looked to her, then recognizing her, relaxed and let himself get lost in admiring the smooth curves of the starship. She came and stood beside him, “She’ll be ready in about two weeks. The construction crews have had to work triple shifts to get her finished along with all the rest, but we’re ahead of schedule right now.” She tapped a few controls on the console in front of them, focusing on the readouts. “This one, as it happens is actually the one you’ll be commanding. We’ve already retrieved what we could of your crew’s personal effects from the remains of the U.S.S. Valorous, and we’ll make sure to transfer them to the new ship as soon as she’s ready.” She sighed, Still a shame about the Valorous. She was a good ship. I bet you miss her.” Laurel looked up to the new ship, folding her arms across her chest and relaxing a bit. “This one’s been christened the Osoyoos, but I received your request for a designation change. Have you decided what to call her, Sir?” She looked to the Vice Admiral, and was surprised to see his expression had changed. The only constant in this universe… is change. It’s been a good run, it really has. I’ve not been the best at keeping this thing up-to-date, but I’ve had some fun and I’ve made my voice heard, if even just a little. But, as Q said, all good things must come to an end. I’ll be no longer posting thoughts, insights and previews/reviews of Star Trek Online on this blog; instead, I’ll be shifting focus to my general MMO gaming blog, MMO Artificer, and all my STO posting will continue there. I’ve already posted a sort of review of the F2P launch on there; feel free to check it out. This blog will instead be re-focused into the central place for my STO fan-fiction stories, as I write the bits and pieces that will eventually become a novel. I hope there are some out there who will enjoy this, but I expect to get even fewer followers than I had before. I guess we’ll have to see what happens. My posts will continue to be sporadic, but I’m putting more focus into my writing and really do want to get better at it. January 24, 2012 Posted by RogueGentleman | Out Of Character, STO - "The Call of Valor" Story	| Comments Off on The only constant in this universe… is change. Not even the ticking of a clock filled the silent void as the U.S.S. Argent Aurora sat patiently amongst a few large asteroids, just as the ship and her crew had been ordered to. The mission was a delicate one, and required a small, agile starship; something the Argent Aurora had been designed to be, as a Nova-class vessel. Sure, the ship was nearing her original construction lifespan and was scheduled for a refit & crew reassignment, but she was still fast and nimble for her size. Commander Jase Galleger stared tiredly at the viewscreen, resting his lightly bearded chin on his clasped hands as he leaned on his knees. He’d been shifting uneasily in the Command chair for the last seven hours; he hated waiting games. He could be a patient man, but he often needed something to distract himself. He usually had a P.A.D.D. nearby that he kept several logic games on, but this morning he’d been in such a rush to be on the bridge that he’d left it in his quarters, and this mission was too important for him to just leave the bridge to get some games. Of course, he’d not expected to be sitting on the bridge for over seven hours, waiting. Undercover operative extractions were delicate matters, and ones where the agent had been undercover in the Klingon Defense Force for over a year were, to say the least, tense. What made this more delicate for Starfleet Command was the fact that the agent had requested an emergency extraction, with only these co-ordinates in her message; no other information. The assumption was that she had discovered incredibly sensitive KDF information, and was either on the verge of being discovered. Or possibly already found. His sentence was cut off by several small warning alarms as a small Klingon ship, clearly damaged from a firefight, slowly de-cloaked on the viewscreen at the fore of the bridge. “Thank you, Mr. Murphy.” Jase said, half under his breath. Rovla gave him a slightly puzzled looks, her Andorian antennae shifting slightly in curiosity, but she knew it best to ask about the comment later. T’Pahl reacted with her typical efficiency. Her hands flew over the console in front of her skillfully & swiftly, confirming the ships identity. “Commander, it’s her. There’s severe damage to all systems, and she appears to have a hull breach, but the emergency force fields are holding. Main power is off-line, and emergency power seems to be already on the third redundancy series.” She turned to face him; Jase could see the ever-so-faint glint of worry hidden in her eyes; they both knew only he saw it. The Vulcan woman seemed to gasp slightly for air for a moment, “This is Commander Surrah; Ships systems are critical and failing, but that’s unimportant. I must beam to your ship immedi…” Her words were cut off as a large, shadowy arm slammed into her head from behind, clearly slamming her into the video receiver, cutting the connection; the viewscreen immediately flickered to the view of her ship. Jase snapped into action. “Vive!” He shot to his Chief Engineer. The Borg implant over the left eye of the Liberated woman flickered as it enhanced her minds processing capabilities, her hands flying over the console in front of her with her typically mechanical accuracy & speed. Jase nodded to Science Officer Blaivo, Vive, then pointed to Lt. Commander Pertho at the Conn; the tall Caitian made a soft, almost purring grunt and nodded his acknowledgement of the order and was first at the turbolift, his tail swishing slightly in mild anticipation. As Jase began to move towards the turbolift after his officers, T’Pahl stood “Commander, with your…” But Jase cut her off; his voice understanding, yet firm. “T’Pahl, you know why I can’t let you come.” He turned to face her as he spoke. “I know it’s family over there; that’s exactly why I need you here. We don’t know who’s still over there, and I need you here to pull us out in an instant; you’re pretty much the best for the job.” His eyes told her much more, and after a brief moment, she nodded in acceptance. “Yes, Sir…” Her voice wavered slightly. “You have the Bridge, T’Pahl.” Jase said as he stepped onto the turbolift, facing the bridge as the doors swished shut. The air within the small ship was thick with the acrid smoke of several green and red fires that almost seemed to fill the emptiness in the cabin. It seemed to stir lazily through the air currents created by the various flames that dotted the interior of the damaged craft like small funeral pyres until five small, humanoid-sized pockets were formed within the smoke-filled air by the transporter lock-on beam effect, the tiny particles of soot that hung drifting visibly swiftly pushed aside to make room for the energies and matter about to be delivered to those spaces; a fraction of a second before the transport beams themselves began to glimmer, and humanoids began to materialize. Jase and his team took a couple of moments to get their bearings in the dimness of the Klingon equivalent to emergency lighting, Blaivo covering his mouth to stifle a slight and quiet cough, despite his conscious effort to be prepared for the smoke. Pertho rubbed the end of his feline snout lightly. “Of course, sir.” he said lightheartedly, as always. He smiled wryly, or at least as close to a smile as his feline features would form. “Good.” Jase turned to survey the interior of the craft. “Tactical analysis, Mr. Pertho.” he turned back to surveying the interior of the craft ahead of them. Jase turned to Blaivo as the stout Bolian smacked the side of his tricorder a couple of times, then gave up, shrugging to Jase as he put it back in its holster. Jase looked to Vive, her Borg eye implant whirring as it shifted through various visual spectrums. Everyone tensed. Blaivo slipped a small Type 1 hand phaser from his belt while Pertho extended his retractable claws from his fingertips. Jase spoke the word they all had in their minds. He pulled his type 2 phaser from his belt as Vive un-slung the phaser rifle she had over her shoulder. He glanced quickly around, making mental note of any possible locations the hiding brute could come out at them from, then turned to his officers. “Vive, you guard our backs. in these close quarters, that rifle won’t get much range, so be careful. I’ll take point. Pertho, you and Blaivo keep your eyes open; we’ve got to get to the command cabin and find Commander Surrah…” The ship groaned around them suddenly, reminding them of the precarious state of the hull, and punctuating their Commander’s next word, “…fast.” They all nodded, and Jase took the lead as they moved through the debris and damage towards the command cabin. The going was tough; the ship had been badly damaged, and several support struts had caved in, creating a haphazard maze. Though the room was only a few meters long, it was slow going and took several minutes. Blaivo was sweating profusely already, his large bulk nearly unable to squeeze through a few places. Vive was able to help the stout blue man through, though. Jase kept the pace steady, slipping through the twisted metal with somewhat relative ease. He turned when he heard Vive gasp in annoyance at something; her comm badge had caught on an errant conduit cable & fallen to the floor. She looked at him and frowned slightly, sighing as she reached down to get it. Jase turned back to the path ahead, trying to find the best way forward. They moved on in silence, through the room and along the wide corridor that made the neck of the ship toward the command cabin. there was little sound save for the crackling of the fires that dotted the walls and exposed access panels. Jase was beginning to feel a bit impatient with their progress, though considering the large piles of rubble and collapsed support beams, he really didn’t see a faster way through. He could barely make out the door to the command cabin through the haze now, and that thought made him smile to himself a bit. Suddenly, Vive screamed, forcing Jase to turn back. A large green, scaled hand had grasped her arm, protruding from the rubble beside her. The Gorn stood; sheets of metal that had concealed him sliding away, revealing the seven-foot tall brute. Blaivo fired a shot with his phaser that was deflected by one of the shifting metal sheets, a puff of charred ozone rising from the metal. The Gorn held Vive’s right forearm in a steel-tight grip, chuckling as it looked at them; it was clear from the pain on Vive’s face that he was crushing her arm. She grunted in pain, her fingers of her left hand clawing frantically at the fingers of hand that held her, to no avail. Their attacker picked up a large chunk of some damaged system in his free hand, easily half a meter square, and threw it casually at Pertho, knocking him back hard into Blaivo, the two landing painfully into another pile of rubble, effectively pinning them. The beast looked to Jase, their eyes meeting; it nodded smirking knowingly, then turned back to Vive; as if the lowly human man was not worth his noticing. Jase looked at the Gorn, already knowing what the situation was, as well. His phaser would take a few shots before it could subdue the large creature, more than enough time for it to snap Vive’s neck like a small twig. Looking at Vive, the Gorn lifted her by her one arm off her feet and brought her face close to his. His large snout sniffed at her. Smiling, the Gorn chuckled slightly. She gasped and gagged a bit in disgust at his breath as he spoke, his voice deep and raspy, “You smell tasty, fuud… I do not doubt your flesh would be succulent with some Me’rash sauce…” He flexed his hand that held her, the sound of the bones in her arm snapping audibly made Jase’s stomach do a flop. She screamed in pain, but to her credit kept it short, the Gorn chuckling in satisfaction despite her small act of defiance. Jase had to do something. He slowly began creeping forward, slipping the small blade he kept in his boot from its sheath, keeping it hidden in his hand as best he could. The dim lighting gave him a slight edge, and he used it to his advantage. Slowly he inched his way closer, doing his best to appear motionless in the dim light, hoping the shadows would throw off the Gorn’s limited reptilian vision. Vive gasped, clearly pushing the pain out of her mind as best she could. The Gorn held her very close. She grimaced in anger at the beast. “I don’t think I would be that appetizing… This meal might bite back!” She reached quickly up almost as if to punch him with her other arm, the Borg nanotubes quickly extending from the release points on the back of her hand and sinking into the side of the beasts face; the automatic injection system still within her released several dozen nanoprobes into his face, which quickly went to work numbing specific nerves through his face, neck and shoulder, while activating other nerves reserved for delivering pain signals. One of her own personal modification to the Borg nanoprobes that still resided within her body. The Gorn dropped her, his arms clawing up to his face as he screamed; in a matter of seconds, his right arm went completely numb and slumped to his side. Jase didn’t waste a second. He took the moment, leaping at the hulking beast, his dagger plunging deep into the Gorn’s eye. The monstrous Gorn grabbed Jase by the nape of his neck with his still functioning hand and flung him across the cabin, then wrenched the dagger free from his skull with his free hand. He gazed angrily at Jase with his still good eye, dark blood pouring from the gaping wound that had been his right eye. It took a step forward, teetered slightly… then collapsed Face first onto Jase’s legs, the thick blood pouring out onto his uniform, and breathed his last. “Acknowledged…” he looked at Blaivo, who nodded. ” We’ve got injured, and found Surrah. Beam her, Blaivo, and Vive directly to…” His commands were cut short by a deafening combination of the transporter beam effect taking hold, and the sudden vaporization of the cabin around them in the blinding white heat of photon torpedo detonations. Before he could react to the surprise, he was on the Argent Aurora, in the aux bridge transporter room with Pertho; he instantly noted that Blaivo and Surrah were not with them. It took him but a moment to realize that Rovla had, as always, anticipated his orders. He shot a glace to the transporter operator, who nodded, confirming it, “Safe in sickbay.” the young man said. Jase nodded his approval, then marched onto the bridge, Pertho close behind and taking his station at Conn.
Their Commander turned to T’Pahl, “Have they detected us?” Jase’s expression became an impassive mask as he focused on the situation. “No, Commander. We’d light up like a signal flair and they’d be on us faster than a pack of starving Targ on lunch. We’ll try to sneak out without firing a shot, like the Admiral wanted. Helm, creep us along this asteroid belt out of their scanning range, one-eighth impulse.” Jase’s voice was calm and steady as he gave the order. The ship slowly began to skirt along the lower edge of the asteroid belt; the Klingon ships seemed to not take notice of the subtle movements as continued lazily sweeping back and forth, performing their standard search. The bridge crew waited silently as the rocks drifted across the upper half of the viewscreen. The only sound seemed to be the soft *blip* of the Tactical station, keeping tabs on the Klingons. Jase took in the expression on each of his officers faces; they were calm and collected, as he’d expected from his seasoned crew. The only one who showed even a slight amount of concern was the one person he’d not expected to see worried; T’Pahl. She seemed to be glancing subtlety towards the turbolift. He knew exactly what was on her mind. “Go see your cousin, Commander. We can handle the Klingons for now, don’t worry. I’ll call if we end up requiring your services.” He smiled a small, soft smile to her. She looked at him, her eyes showing the relief she felt, though she kept the rest of her features her usual Vulcan calm. She began to stand, but was stopped by a small warning signal from her console. Her brow furrowed in confusion, and her focus locked on this new dilemma. “Commander, I’m detecting a small metallic signature with minor electromagnetic properties; I think it’s artificial…” Suddenly her eyes widened, “It’s moving…! Too fast! Brace for…” Her words were cut off as the ship rocked from an explosion on the port side, the inertia dampeners unable to compensate for the sudden shift in the vessel; Pertho struggled to re-gain control of the helm as alarm claxons sounded across the bridge. Rovla interrupted, her gaze locked on her console. “Sir, I think that’s the least of our worries…” She tapped a few commands, then nodded towards the viewscreen. All three Klingon ships were headed straight for them. “Lieutenant Pertho; take us away from the asteroid rings and get us out of here, best speed.” Jase stood and moved a step forward, centering himself on the bridge as he tugged at the base of his jacket. The Argent Aurora dove and accelerated away from the asteroid belt just as the first of the Birds of Prey reached firing range and fired. The first shot missed, a credit to the Caitian’s piloting skills, but a few green bolts of energy began pelting the aft shields. Pertho skillfully twisted and turned the ship, avoiding several of the disruptor bolts from the Klingon vessels, but not all, and not enough. The shields were clearly weakening fast. “Lock on aft weapons and fire phasers.” Jase was uncannily calm, which was usual for him in combat situations; his crew was used to his apparent lack of emotional reaction in moments like these. On the viewscreen, beams of bright orange energy lanced out from the Argent Aurora’s rear phaser emitters, several striking the Bird of Prey in lead pursuit. Jase turned to Rovla for a report. The dull red glow of the Command Deck made the view of the Federation ship on the viewscreen easy to see. Commander Po’rath of the KDF cruiser Voch’kah smiled wickedly as he watched his prey attempt to run. The Starfleet dogs were making a fatal mistake, he knew, by attempting to use the moon to mask their childish maneuver. From their trajectory, he could only assume they were trying to bait the Klingons in an attempt to get behind them. “Helm; slow to one quarter speed, and signal the other ships to match. Let the fools circle back into our forward cannons.” He laughed as, on the screen, a shot from one of the birds of prey hit the port nacel, and the enemy ship began venting smoke. “Yes, Lieutenant, I can see that.” Jase’s eyes were locked on the forward viewscreen; the path ahead of them was filled with the mines. Pertho’s fingers danced a quick-step across the helm controls, trying to keep them from plowing directly into most of the mines. A few were still getting through, despite his best efforts. “Keep it up, Perth, you’re doing great.” Jase clasped the helmsman’s shoulder reassuringly and also for support, as another mine hit the shields, rocking the ship. “Sir, it’s working!” T’Pahl watched her readouts, a slight hint of a smile beginning to creep onto her features. Jase noticed and made a mental note to harass her about it later. When they got out of this. “Five CCs of Therazine!” The Bolian called, his hand held out expectantly as the nurse placed the hypospray into his grasp. Blaivo’s brow was sweating slightly, more from the concentration than the heat, although he was beginning to think that the environmental systems might have gotten damaged slightly in all the commotion of the battle. Surral was on the operating table in front of him, and he was fighting to keep her stable. He knew he was losing the battle. The Gorn bio-toxin was ravaging her nervous system, and he was struggling to keep her organs from shutting down, at the same time he was surgically attempting to repair the very large wound to her back; almost a third of her back had been ripped off. The going was difficult, as they weren’t just gashes cut into her flesh; there was actually loss of tissue, like huge strips had been ripped out of her back. It was making it all that much harder to regenerate the tissue and reconnect the needed blood vessels and arteries. He was having to work inch by inch, while keeping her sedated and restrained. the work was slow and delicate, and could not simply be put off until later. Blaivo was already certain she would not walk again. Even under ideal working conditions, by the time they got her back to a Starbase medical facility, the damage would be very likely irreversible. With how things were panning out for them, it was pretty much a guarantee. He’d pretty much given up hope of repairing her spine enough to walk; he focused now on repairing enough of her that she’d at least live. He wasn’t sure how long he could keep her alive under these conditions without the blasted Gorn bio-toxin running rampant in her body, shutting down organs one by one, as he tried to reconnect the numerous arteries along her back and keep her from bleeding to death. Commander Po’rath smiled wickedly at his first officer, gesturing to the viewscreen as the Argent Aurora began peeking over the northern pole of the moon. “You see? Just as I expected. Predictable; the Starfleet p’tach walks right into our blade.” he turned to the weapons officer, noting with satisfaction the slight look of shame on his first officer’s face. “Lieutenant, prepare to fire all forward batteries.” The weapons officer turned to his console and obeyed without reply, then nodded that he was ready. “Commander…” The first officer’s voice was uncharacteristically concerned. Po’rath turned to face him and found him pointing at the viewscreen, his eyes slowly getting wider. Disgruntled, he turned to see what had the first officer shaken. He found he was unable to disagree with his first officer’s reaction. The Argent Aurora had come over the moon, as expected, but much faster than anticipated. And she wasn’t alone. Following her were at least two dozen objects that looked like old-style Gorn magnetic tricobalt mines, all being magnettically drawn to follow the starship as it was swiftly closing the distance between itself ant the Klingon ships. The bridge erupted into chaos. “Full power to forward shields!” Po’rath shouted, taking his seat, “Activate defensive batteries! Hard to port, full impulse power!” Sweat was already beginning to trickle down his forhead ridges. He knew full well they’d not be able to turn in time, and that many mines so concentrated would plow through their shields and rip through the hull. He’d realized then that he had been foolish. He’d let his pride cloud his judgement, he’d let himself fall prey to a superior enemy by facing his enemy head-on; the bridge would most likely be the first thing hit by those mines, obliterating everything they struck. Including himself. He didn’t get a chance to regret that guess being right. The bridge crew of the Aargent Aurora burst into cheers as the command module of the Raptor command ship exploded, the chain reaction flowing down the neck of the ship to the drive section. They were already safely past the edge of the blast radius when it’s warp core went critical; the two birds of prey were not quite so lucky. Huge parts of the Raptor were flying in all directions. One of the birds of prey was struck dead-center by the Raptor’s nacel, destroying it almost instantly. The other was struck by other debris from the explosion, it’s engines clearly damaged. It was dead in the water as the Starfleet vessel sped away. “Jase!” T’Pahl shrieked, her eyes locked on the viewscreen behind him. He spun, Pertho already hard at work on the controls as ahead of them a Vor’Kang battle cruiser de-cloaked dead ahead. It ripped into them with heavy disruptor cannons and photon torpedoes. Jase was thrown to his feet as the ship rocked to starboard, the inertia dampeners unable to compensate for the sudden change in motion. The Argent Aurora turned onto her side, her ventral hull exposed to the battle cruisers weapons. Within seconds, the shields were down. Jase was almost deafened by the explosions. Time seemed to slow as utter chaos erupted around him. He could feel them ripping through the ship, the telltale vibrations rippling through the deck. The outer hull was breached, he was sure of it, and probably in several places. Panels all over the bridge were bursting into flame; Vice dove away from her station just as it exploded. T’Pahl was trying to contain a fire near her station with an emergency fire extinguisher, the fire suppression systems clearly offline. He rolled onto to his side; pain laced across his ribcage and right arm, making him wince. Two ribs and his shoulder was likely fractured. He opened his eyes. Pertho was on the floor beside his chair and did not appear to be moving. No Jase screamed in his mind. Using his left arm, he crawled towards his helm officer. It felt like hours, but within moments he was beside the Caitian. Still no movement. Jase felt for a pulse, and breathed a sigh of relief; it was faint, but it was steady. Grasping the chair beside him, Jase hoisted himself back to his feet with his good arm, and found his right ankle had also been injured. wen it rains, it pours he thought to himself. He turned to survey the bridge. It was in shambles. He heard T’Pahl trying to comfort an ensign ho was sitting on the floor, blood oosing from a wound to her stomach that had a broken shaft of metal embedded in it. The young woman was deathly pale, and the light was fading fast from her eyes. he heard T’Pahl telling her that everything would be alright, that they’d get her to sickbay… That’s when he realized. He could hear T’Pahl. The explosions had stopped. He turned to the viewscreen. Sure enough, the Vor’Kang battle cruiser was still there, and had indeed stopped firing. Before he could wonder any further, Rovla told him what he knew would be coming. The image before him was of a well groomed, grey haired Klingon General. The look of arrogant smugness on his face spoke volumes to Jase. Probably from an ancient Klingon house, likely with immediate family on the high council, and irritated at being sent to deal with them. He spoke calmly with the air of an aristocrat and a hint of disdain. “Federation vessel. You are at my mercy. You are declared prisoners of war and will give an unconditional surrender.” He looked directly at Jase now. “You fought well, Commander, and with cunning. I respect that. But it is over. I will allow you three minutes to inform your crew to prepare to be boarded and taken into custody.” With that, the transmission ended. Jase smirked at the viewscreen. It’s not over, big guy. The fat lady hasn’t sung yet. His thought was punctuated by Pertho groaning and beinning to stir. “Are you badly injured, Lieutenant?” Jase asked, making his way to one knee and offering his good hand to the large feline. Pertho accepted the help, leaning on his station as he helped Jase back to his feet, holding a furry hand to his head. “Only some bumps and bruises, and a doosy of a hangover headache…” He chuckled that purring chuckle of his. Jase looked to T’Pahl with a smirk, which left his face as quickly as it formed. Their eyes met, and not a word needed to be spoken. The young ensign lay slumped beside her, lifeless. She nodded, already knowing Jase’s line of thought. She began gathering the personel, helping the injured to the turbolift. Jase ground his teeth in frustration as he leaned at the small bar in his ready room, then took another swig of the synthohol. Commander Kityanna stood a few feet behind him in silence, her arms holding her waist tight, her head slightly bowed as tears slowly welled up in her eyes. Her long dark hair framed her face like a dark hood. “Jase… I don’t understand this at all… What’s gotten into you…?” Her voice cracked slightly, the hurt clear though she tried to keep her voice steady. The fight was not going well. Jonas Galleger deftly caught a wildly thrown punch between his arms that had been meant for his face, twisting the arm in his grip skillfully. The Naussican boy’s arm gave an audible *snap* as it broke cleanly. The man then pulled his attacker downward, slamming the boy’s head into Jonas’ raising knee, knocking the Naussican unconscious immediately. For these young Naussican thugs, the fight was not going well at all. Two more Naussicans came rushing at the aging human from the shadows, thinking that they would be able to catch the older man off-guard.